Miss Isabella Corlett (on the right) first came to teach Quorn infants on 2nd October 1865, when there were 40 pupils. She became headmistress of the infant school and left in 1906 when there were 230 pupils. The teacher on the left looks like Mrs Adams, the wife of the headmaster Mr Charles Adams. Note the pinafores worn by the girls, to protect their dresses. It was easier to wash pinafores than dresses! 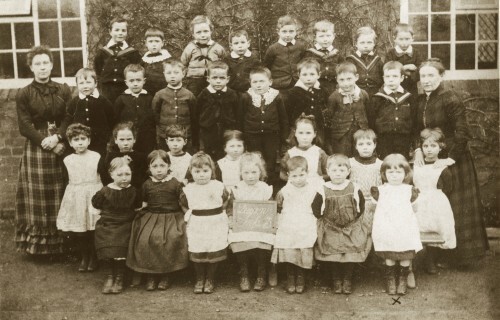 Missing information: Can you name any of the pupils?